Fall Canyon is one of many colorful ravines in the hills surrounding Death Valley in California; shaped by occasional flash floods that flow from the higher mountains beyond, the canyon is remote and little-visited; deep and moderately narrow for many miles, with occasional shaded, cave-like passageways of great beauty. Some of these narrow, twisting sections are enclosed by smooth granitic walls with an unusual bluish tint. As with most other Southwest canyons, the rocks are layered, but quite differently to the orderly slot canyons of Utah - here the strata are multi-colored, buckled, twisted and eroded, the result of ancient geological forces. Fall Canyon is easily reached and offers a perfect wilderness experience, though it should be avoided during the summer months when the weather becomes too extreme. 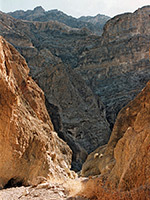 Fall Canyon is located in the Grapevine Mountains, towards the less-traveled north end of Death Valley National Park. It is close to Titus Canyon, another colorful ravine that is popular because of the rough one-way track that extends through it - this is a 4WD route that starts from road NV 374 in Nevada, crosses the flat Amargosa Valley into California and then winds through the hills and down the canyon, finally emerging into Death Valley after 26 miles where it joins the main park road CA 267. Two-way traffic is permitted from CA 267 to the mouth of Titus Canyon, and this also provides access to Fall Canyon; there is a parking area and a short footpath that leads north across sandy hills to the point where the usually dry streamway exits from the enclosing cliffs and spreads out into a wide, stony wash, beyond which the flood waters disperse into the valley. No special permit is required, just a standard Death Valley National Park entry fee. 13 views of Fall Canyon. TopoQuest topographic map of Fall Canyon. 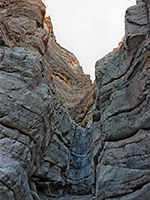 The streamway at the mouth of Fall Canyon is quite deep and many yards across - larger than that of nearby Titus Canyon, and powerful evidence of the great floods that sometimes rush out following rains over the Amargosa Mountains many miles away. Upstream the canyon soon narrows and becomes several hundred feet deep. 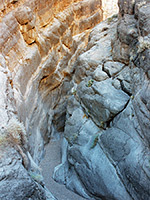 The rock walls are stark, eroded and crumbling, colored variously black, brown and grey, with tints of red and green - often near vertical, but the canyon is not yet particularly narrow despite occasional sections only around 15 feet wide. 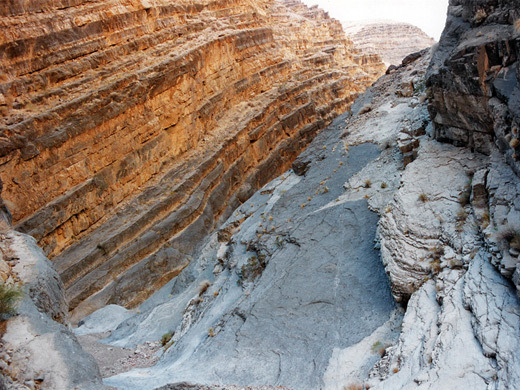 The rock strata may be horizontal, vertical or any orientation in between and have an appearance of great age, telling of extensive geological changes. The character of the ravine remains similar for 3 miles. There are some features of interest such as narrowish side canyons and tight curves in the streamway with channels of smooth rock. 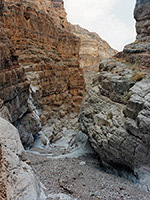 The main canyon becomes deeper - up to 2,000 feet in places - with stepped cliffs and plateaus of increasing height towering above. At the 3 mile point, progress is interrupted by a 20 foot dryfall but this is quite easy to overcome, by scrambling up a slope on the south side. Thereafter the canyon becomes quite different, forming unusual narrows with sharp bends through smooth, dark, marble-like rock. Sometimes the channel runs between strata while in other places it cuts through, resulting in contrasting colors and textures. The streamway opens out after about a quarter of a mile and becomes similar to the lower stretches, but with more frequent narrow passageways. Fall Canyon extends for at least another 6 miles and could be explored more fully on an overnight backpacking trip; camping is allowed beyond the 2 mile point. The vegetation changes gradually up the canyon and wildlife becomes more apparent, as the climate becomes slightly more moist; large ferocacti and yucca grow after a few miles, and bighorn sheep inhabit lands above the dryfall. Walking conditions are generally easy although the surface is mostly composed of small, shifting pebbles, and the walk can become tiring after a while. When I visited, on a sunny, windless day in December the temperature was about 70°F and the silence on the whole trip was absolute. There was no sign of life, and the canyon presented an epitome of remoteness. 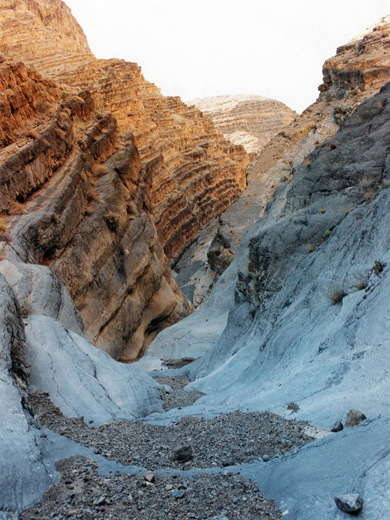 This is certainly not a hike for summer - the canyon offers no shade or water and the trip is sufficiently strenuous to become too difficult in the prevailing temperatures of well over 100°F.